Okay the good stuff is towards the bottom of this post. But first let’s talk Stitch Fix. I wanted to like Stitch Fix. I wanted to like it so bad. If you don’t know what Stitch Fix is it’s a personal shopper service that costs $20 a month and they send you 5 picks, and you can apply a $20 credit towards purchasing any of those picks. Once a month 5 clothing items show up at my door and all I have to do to send them back is put them in the included bag and in the mailbox? Sounds good! Lots of people, especially bloggers, love it. My first Stitch Fix actually came in May and was such a bummer I didn’t post about it here. In fact I emailed Stitch Fix and complained about how bad it was. Want to know how bad it was? I requested Summer pieces for Atlanta – where it’s very hot. I said maybe some outfits I could wear to the beach or pool, tank tops, dresses, etc. Well the first thing I pulled out of the box was a purple cardigan. A cardigan that was pilling like crazy and stretched out terribly – not to mention a piece I have no need for in May in Atlanta. The next piece I pulled out was blag baggy capri pants. I can’t even… then there was a hideous orange 3/4 sleeve top, a tank top that looked like something a 10 year old would wear, and a maxi dress that was actually cute but cost around $70. No thank you to all of them. Well my box this time was slightly better, but still overall a disappointment and I’m pretty certain I’m sending them all back. The first thing I pulled out was the Dexter Faux Wrap Dress ($68). I don’t wear anything with long sleeves in the Summer, and this honestly looks like something a teacher in their 50’s would have worn 10 years ago. Next was the 41Hawthorn Colibri Solid Tab Sleeve Blouse ($48). This does look similar to some tops on my pinterest board, but still I can’t do the longer sleeves and it looks a lot like a top I already have, only I like the one I have better. Now at least I received two tank tops as that’s what I specifically requested. The Renee C Hythe Scoop Neck Top ($44) was okay, but not love for me. Now the Alannah Henley Blouse ($38) is much more my style and budget, and something I would consider keeping, if it wasn’t completely see through. I can’t do tops that I have to wear a cami under. Finally there was the Wilma Half Beaded Lariat Necklace in my box ($28). I was very confused as this necklace doesn’t go well with any of the tops in the box, but it’s rather ugly so not something I’m interested in keeping. I’ll stick with RocksBox (don’t forget code “cervinoxoxo” will get your first month free) for jewelry. But now on to the good stuff. I ordered a romper and some tanks from Nordstrom and was so excited to get them in the mail. All of the tanks I purchased on sale. The romper I’m obsessed with was full price but it was only $42 (plus 6% cash back with ebates) so I was okay with that. This is the first romper I’ve ever owned and I can’t wait to wear it until I’m sick of it! The tanks are all simple and similar, sure, but I have a lot of fun shorts that I need simple tanks for pairing with.The first tank was $15.90, second was $25.20, and third was $19.20. Of course my favorite tank was the most expensive and is the only one I’m probably going to keep.The first and third just didn’t fit quite right, the first being a little too short and the third being a little too tight. Let me know your thoughts on what I should keep and I hope everyone has an amazing weekend! LOVE all of your clothes! That romper is adorable! Thank you 🙂 Yes I was so happy to finally find a romper that I love! and THIS is why I wont try Stich Fix. I know everyone loves it, but I just imagine there are a lot of stories like yours.. however I DO love all the stuff you got at Nordy's!! Thank you me too! And yes – I've decided too many bloggers say they like it because they want referral credit to get free clothes… maybe it's just my stylist though because I've seen some bloggers who get really cute clothes in their fixes! Way more than I spend on clothes! I am fashion blogger, but haven't tried stichfix yet….Might check it out! The romper is adorable, looks great on you! Thank you! I'd been looking high and low for a romper I liked! Maybe it's just my stylist! 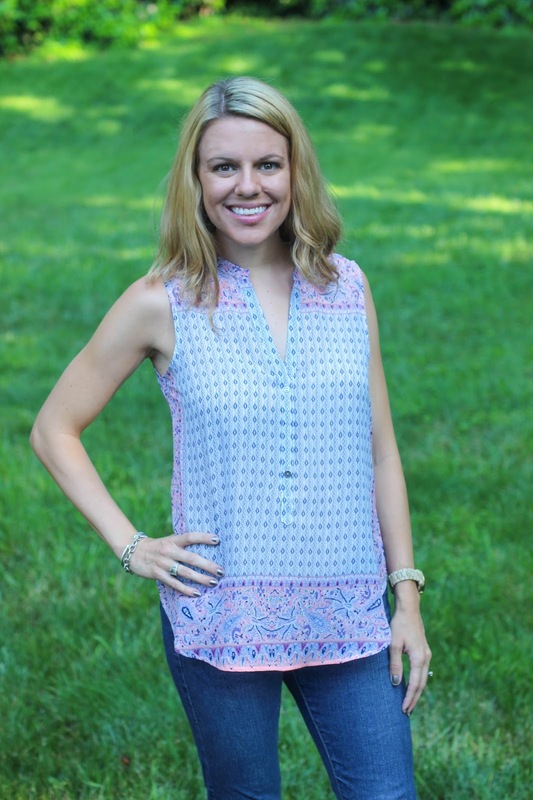 I've read a ton of Stitchfix reviews from people who have gotten amazing boxes that I would have loved! The right most tank is definitely my favorite! Mine too! If it wasn't sheer I really would have considered keeping it! I'm so glad you posted about your not so good experience with Stitch Fix. I'm also not a fan for a number of reasons and it drives me crazy bloggers only write when they like it. I'd rather buy in my own! It all looks great on you though!! Thanks 🙂 Yeah I think a lot of bloggers just want to get readers to sign up for it so they can get referral credit and spend it on free clothes, which is fine, but what's the point if it's not even good clothes? That's what I was looking for too – I can't do super short or open back ones – and I love how high cut this one is… strange because 5 years ago I would have wanted super short, open back, and low cut! You know I like to be honest about things! Some things you love and some things you don't, no point in pretending to love everything! 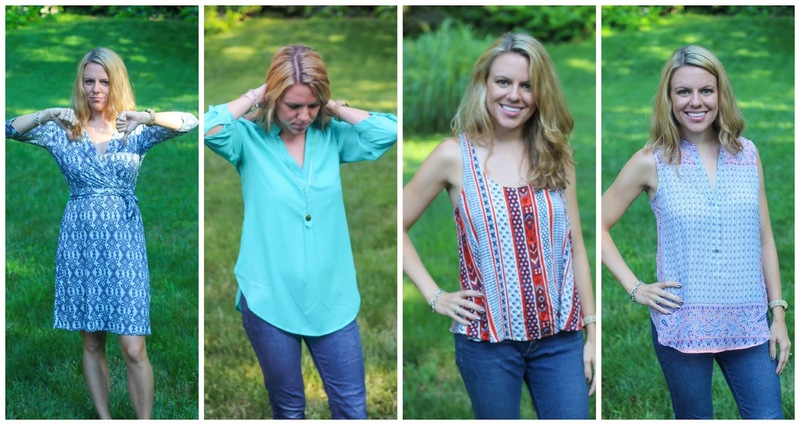 Stitchfix is such a hit or miss; I have yet to get a fix with 100% success! Good thing you had your Nordstrom Haul to make up for it! Sometimes I see reviews boxes from girls who got AMAZING items – ones I would love! Just didn't hapen for me! I haven't tried stitch fix or rocksbox? What is rocksbox and how does it work? I've heard mixed reviews about Stitchfix, but like you I don't think I would like it. It seems excited to get clothes that you don't know what they're going to be but I feel like in the end, you would just wish you had picked them out yourself.